*I use small amounts of honey, bananas, and blackstrap molasses in some of my recipes to enhance the flavor and texture. Those recipes are not strictly sugar-free. However, the carbohydrate count per serving of every dessert on this website is less than 10 grams net carbohydrates (total carbohydrates minus the fiber) per serving, making the desserts very low in sugar. If you’re on a strictly sugar-free plan then you can choose to avoid those recipes with honey and molasses. For reference, most regular desserts contain 20-40 grams of carbohydrates per serving! You might hear any of the above listed sweeteners referred to as “healthy, natural alternatives to white sugar.” Regardless of the presence of any trace nutrients found in these sweeteners, they still contain the sugars glucose and fructose, and are NOT sugar-free! Consuming significant amounts of those sweeteners listed will prevent you from reaping the benefits of eating a low sugar (i.e. low fructose and glucose) diet. I personally consume as little sugar as possible (not including fruit) because sugar triggers my appetite like no other food! Have you ever seen someone who can eat a pint of ice cream in one sitting? I am that person. Research shows that some people are much more prone to sugar addiction than others. It’s not just about willpower when it comes to controlling your portion sizes of sugary foods. Readers of this blog left comments over at one of my old recipe posts explaining why they limit their sugar consumption. Feel free to share your own story below! Here are some of my favorite nutrition science resources with information concerning the effects of sugar on the human body. I am not a medical professional, so nothing on this website constitutes medical advice. Please consult your own health care provider for advice on your unique situation before beginning any nutritional program. Stopping Addition to Sugar: Willpower or Genetics? 8 Comments on What is “Sugar-Free”? Hey Lauren! Your site is terrific – I am pretty stingy about low carb/sugar sites because many times the recipes are chock full sucralose, aspartame, etc. Thank you for developing something that uses some other alternatives such as stevia. I also am very appreciative of your transparency on what is defined as sugar free vs. not. Keep up the great work! James, you are very welcome! Thank you so much for the nice comment. Hi, Jenny! Do you have links to journal articles about differences in how the body absorbs the glucose and fructose in honey and maple syrup vs table sugar? According to the nutrition labels, 1 tablespoon of honey contains 17 grams of sugar, and 1 tablespoon of maple syrup contains 12 grams of sugar. I am primarily concerned about the effects of glucose and fructose on insulin secretion and blood lipids. Thank you for sharing that information about the polyphenols and minerals in those sweeteners. 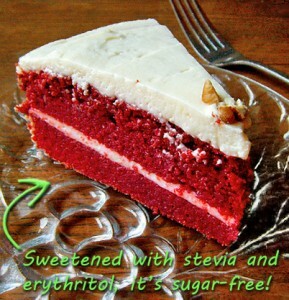 I was looking for your recipe to make your own Stevia/Truvia but could not find it. Could you send that to me so that I can make my own. Thanks and I love this site. One more thing. I’m reading your book again. This time as a text book and am taking copious notes. I’m also checking out the sources you listed for further reading.Thanks again.